My readers with a sweet tooth will be glad to hear that they’re in luck this week! I didn’t have much time to cook before I left for New York last week, so I combined freezer leftovers with what produce was left in my fridge to produce some very tasty, but not very blog-able, meals. Since there are always a lot of nuts and dates in my home, however, I was able to produce some sweets and nut milks, as well as a recipe or two for Halloween (more of those soon). In the next few days, I’ll be sharing the fruits of my labors. First up is this delicious nut milk. 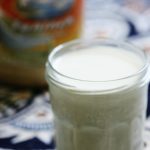 It’s a new recipe for me, my first time using maca in a nut milk, and I was pleased with the results. Maca, for those readers who aren’t familiar, is a root vegetable native to the Andes of Peru. It’s what’s called an “adaptogen”–a name given to ingredients that are thought to help balance hormones and stress. It’s also said to boost sexual desire and improve mood. While some of these claims are likely overstated, there are at least a few studies that suggest maca’s efficacy in stabilizing depression after menopause and increasing libido in men. Perhaps there’s something to the lore! Maca can be found online (Amazon, Vitacost, Sunfoods) or at most health food stores. It’s expensive, but the serving size is small, so you can treat the purchase as a pretty lengthy investment. I’m fairly sensitive to the taste of maca (which is unfortunately very hard to put into words–I guess I’d call it “earthy”? ), so I tend to use modest portions. Two teaspoons, which is what is called for in this recipe, is about as much as I’ve ever used at once. You can add maca to smoothies, puddings, nut milks, or chia seed concoctions. Right now, I’m enjoying gelatinized maca from local D.C. company Sacha Vida, whose oils I’ve blogged about in the past. Sacha Vida always makes high quality, ethically sourced products, and this maca is no exception. 1. Blend all ingredients together in a high speed blender for 1-2 minutes, or until completely smooth. 3. Pour the nut milk through the cheesecloth or nut milk bag, and into the container. You may need to work in batches. Allow it to strain for 1-2 hours. Transfer the nut milk to an airtight container. It will keep in the fridge for 2-3 days. Reserve the pulp for some almond pulp porridge, or the macaroon recipe below! Makes about 3 or 3½ cups. As always, you can discard the pulp if you like, use it as part of a breakfast porridge, or you can get fancy, and make macaroons! For those of you with dehydrators, this is a super fun, easy recipe and a great way to take almond pulp off your hands. 1. Use a food processor fitted with the "S" blade to mix all ingredients together. You should have a thick "dough" that's easy to shape, not too sticky, and definitely not too "wet." You can add more almond milk to make it more pliable, and you can also add more coconut to make it drier. 2. Use a tablespoon to shape the mixture into macaroons. Arrange them on a Teflex-lined dehydrator sheet. Dehydrate 8 hours, or overnight. Stored in the fridge, macaroons will keep for about a week. Of course, you can add maca to regular, vanilla almond milk–no need for the chocolate here. But there’s something about the combination of maca and chocolate that makes it far more palatable to me. If maca isn’t your thing at all, or you don’t happen to have any on hand, don’t wait to make the chocolate almond milk. It’s dreamy. 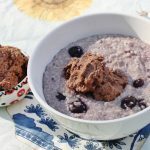 3 Creative Uses for Almond Pulp: Raw Bread, Raw Zucchini and Almond Hummus, and Raw Chocolate Protein “Fluff”! Previous Post: « Sweet Potato Jack-O’-Lanterns With Chocomole Frosting. Plus, Melissa’s Wedding Recap! I’ve had maca chocolate bars on numerous occasions, and I love them! But I’ve never used maca in a recipe before. I have a jar of maca powder in my pantry that I’ve been meaning to use. I just haven’t found a use for it! 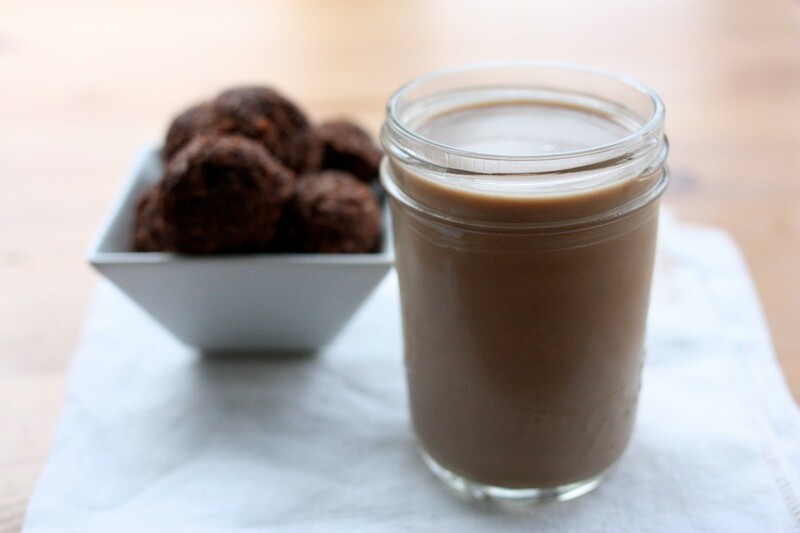 Chocolate maca almond milk sounds perfect. I haven’t made almond milk in awhile. I need to–it tastes so good–it’s just one of those things I forget about doing. Also, I have a totally random question. I bought some raw cacoa nibs once & used them in a smoothie & one or two other things (not a huge quantity mind you) & it made me totally sick! I don’t think it was a fluke since it happened a few times before I put two & two together. Wondering if you’ve ever heard of this? I haven’t, but you might be sensitive to one of the compounds in raw cacao, which the heating/processing of normal cocoa strips away. 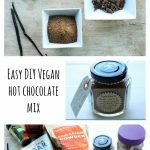 You can absolutely use regular cocoa powder for this recipe — I use it myself whenever I’m short on the raw stuff. Sometimes it’s less potent that cacao, so you can add an extra tablespoon if you like. your space is sooo informational – never heard of maca before but something to really look for. 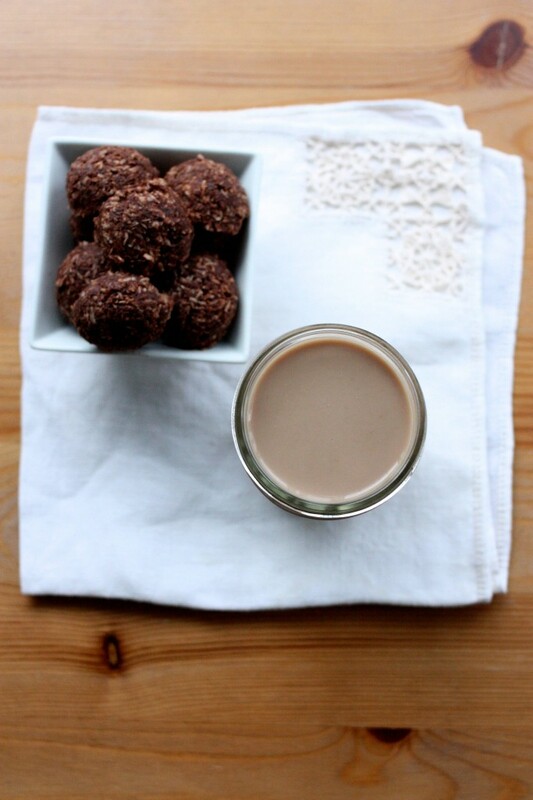 Maca and chocolate work wonderfully together. 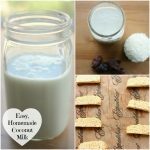 A great spin on cookies and milk. 🙂 As a medical student I’m really fascinated by the work of Dr Robynne Chutkan – it’s incredible that lifestyle management and nutrition are given the importance that they deserve in this evidence based medicine practice. Thanks Nabeela! Working with Robynne has been such an eye-opening experience for me. So glad to hear that, as a medical student, you’re interested in a combination of lifestyle management and evidence-based therapies. I’m also sensitive to maca and have to go really easy on it when I do add it to recipes. I’ve never tried it with chocolate though, and that sounds really good! 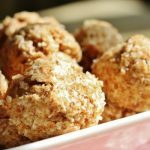 I love your idea for almond pulp macaroons too – I never quite know what to do with the leftover pulp! Thanks for great blog and recipes, much appreciated. This sounds so yummy–I can’t wait to try it! Is there a way to make the macaroons without a dehydrator? Thanks! Some of my dehydrated recipes work in the oven, but alas, not this one (so far as I’ve tried). So sorry! Last night, I found a Vega Maca chocolate bar at the bottom of my blue bag. I must’ve squirreled one away while staying with you. It made me so happy — mostly because of the you-memories. Brendan told me he sometimes blends a whole bar up into smoothies. Just take a minute to let that one settle in. Yum. Awesome! Can’t wait to try the chocolate almond milk! I’ve been a long time reader of your blog. You have definitely helped me become a better vegan. Thanks! Who doesn’t want a little chocolate in their almond milk? This sounds like such a lovely flavor combination, and I’m sure I’d enjoy it warm with some of the macaroons! 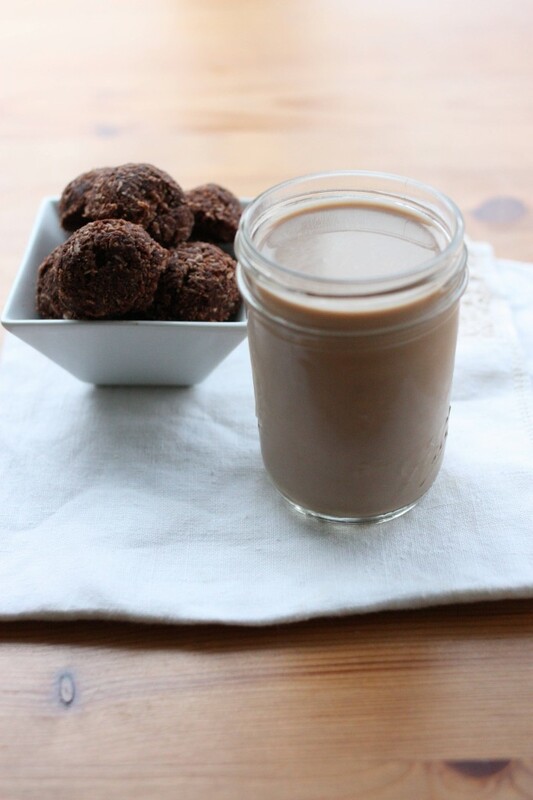 Love the combination of maca and chocolate together- it reminds me of a malt milkshake without the dairy! I love maca, I always put it in smoothies, haven’t thought to make milk with it before though- nice idea! Hey Gena, FYI there is a thing titled “Link Love” right underneath this comment box- and it’s promoting an article on 3 reasons to eat sardines. Just thought you’d like to know! Yum! Maca and chocolate are so great together. It always reminds me of the malted chocolate milkshakes that I’d share with my dad when I was a kid. I like the 2 for 1 recipe deal, too. Creative and frugal! Even though I love maca, I don’t eat it too often. I first tried it out when I found out I had adrenal issues because it’s been touted as something of a magical pill for adrenals. As far as I understand the term ‘adaptogen’, it should promote balance/stabilization, but over time it became too stimulating for me. I’ve met people who swear by its efficacy for energy and hormonal balance, so I’m not knocking it by any means. I just wanted to throw in my two cents because uneventful and/or negative experiences with maca aren’t voiced very often (and I know there are others out there!). I think it’s similar to chocolate and people’s varied reactions to its components; there’s no need to fear it, but only pay attention to how you feel when you eat it and proceed accordingly. I love stimulating things, so I love the maca buzz, though I should also note that part of the reason I love things like maca and coffee so much is that I don’t feel uncomfortably stimulated by them — even when I have a lot — and they don’t impact my sleep. You are absolutely not the first person to tell me that maca gives them too much stimulation, so your comment is a very helpful and necessary perspective to have here! These look delectable. Just what i need to satisfy my sweet tooth. These look awesome… I love maca a ton! I’m going to have to give it a rip, seems like something I could eat without completely destroying my diet for a week. This looks so delicious Gena! Is maca stimulating? Otherwise I’m thinking this would be the perfect bedtime drink. Also, presumably I could strain the almond milk before adding in the maca, cacao, etc. and blend those in afterwards? Then I can have non-flavoured almond pulp to use in other recipes. You can definitely, definitely strain first and flavor later. And yes, maca is stimulating (note my response to Marissa’s comment, above, so try a small amount and see how your body responds. I can have quite a bit, but I can also chug a triple espresso and fall asleep a few minutes later (which is probably not a good thing :-)). My description of the taste of maca? Burned rubber tire with butterscotch. Yummm. I will try this recipe, maybe it can work. It still isn’t as bad as my failed experiment with spirulina – no one told me that throwing a huge tbs of it in my smoothie would make it taste and smell like horse manure. Ah, live and learn! Ooof! I can only do spirulina in small amounts, too. Oh fun – love the look of the macaroons. Yum on both accounts =) Love the idea of adding maca to things other than smoothies and oatmeal! Just made a batch & it’s chilling in the fridge. Except I had to use cashews. My husband is clueless & when making my grocery list he looked in the fridge & told me I had 2 cups of almonds. Apparently he doesn’t know the difference between cashews & almonds. Was bummed not to have pulp left to try the macaroons. If I’m craving instant gratification, how much store bought almond milk would I use?